I LOVE it when companies that I already enjoy ask me if I’d like to give away some free money to one of YOU! Have you heard of MYHABIT.com before? If you like to shop online and you like a good deal, then you will enjoy MYHABIT! MYHABIT is a private sale site from Amazon.com, offering up to 60% off designer brands for men, women, kids and home. And if you live in the good ‘ole USA, shipping is FREE! I have been a subscriber to the MYHABIT site for quite awhile now and enjoy perusing the emails and site for good deals! Watch the following video to see Serena in action and learn how to make the perfect, quick & easy Pasta Arrabbiata (that is fancy-chef-speak for “yummy pasta sauce”). Leave a comment on my blog telling what you liked about the video and your favorite item from the Serena Bass sale event. Make sure to fill out all entries on RAFFLECOPTER below. One lucky winner will be chosen at random through Rafflecopter. I like the nice knife! And the video showed me how to make a simple, yet elegant dish!! Totally going to make it. I loved the bamboo cutting board and the sleek knife! Loved the cutting board & knife. Also loved how simple yet delicious the sauce looked. Never would have added lemon zest to my sauce might have to try that. I liked watching her make the sauce! It’s like I was there in the kitchen smelling the heavenly flavors. I like the chopping block! They make a recipe look easy! I’m loving the chef knives! My husband is a big fan of pasta and I love how easy, quick and yet elegant this dish turns out in the end. I would love to try out a bamboo cutting board. I have the glass ones. I forgot to say the favorite item — I could really use another good big cutting board so I was checking that out! The recipe looks like a great ‘quick’ weeknight meal! I loved the knife and the cutting board the best! It was nice 🙂 I love her kitchen 😛 And her cutting board! I love the knife, I am a sucker for a sharp knife. The pasta sauce sounded fabulous. Watched the video and liked that she used the products she has created and/or recommends. I like the mundial knife and would order it. love that the recipe was easy! I love your blog.Thanks for sharing your new contest with us all. Have a wonderful week! I loved her kitchen – especially the colors. I also loved how simple and do-able the recipe was. On MYHABIT, I liked the Reed & Barton English Gentry Silver-Plated Hostess set – just what I need! I love that she narrated while doing the actual slicing and cooking of this very simple recipe. The pasta looks delicious and I want to make it for my family. I love the white plates and the sharp chef’s knife. um… hello the recipe of course! Can’t wait to try it at home! Looks soooo yummy! I love my knives but that cutting board looks awesome! I liked her accent! And I could definitely use that knife. I really do want to try that sauce recipe, barring any judgement from the “It’s only 10AM” crowd. I’ve been up since 3, I’m ready to eat! I also liked how her eye shadow matched her apron. Neat trick! That gray apron set is for sale! I want it! I love her coppery pots – they look so pretty I am not sure I would want anyone to use them for cooking. I am temped by them. Especially the one that goes in the oven. p.s. I love your blog background. p.p.s. I am jealous you are going to Haven! I love the cutting board and I just love watching a professional chef do her thing! Thanks! Love the cutting board & may even try the recipe tonight with salmon! Also signed up for myhabit.com. Love it! Just did all three. Cannot wait to check out MyHabit! I love that she says it’s going to seem like you’ve been cooking for hours. I love things that have that complicated taste, but are super simple enough to do on the weeknights. From her sale, I love the Matfer Bourgeat Greek Relief Pastry Mat. Great video – love the copper pans. I liked her saucepan, and the pasta arribiata that she made looked delicious! However, I wouldn’t mind having the knife or the cutting board! Loved how easy but elegant the final result looked! Sounds selfish and a recipe written on the menu for the weekend! Love the copper sauce pan!! Beautiful! Something like that would definitely spruce up the cooking mood for me at times!! I loved the simplicity of the video and the knife recommendation. I shopped around and saw a lot of toss pillows I’d love to own. Love the gray motif one! Thank you for a chance at the giveaway! I love the two tone chop board. Mmmm. the sauce looks yummy, must try this recipe!! I’ve never made my sauce before and I love how she makes it look so easy. My favorite item is the Ruffoni Historia Brazier Pot. I love the simplicity of the Arrabiata sauce! Could certainly use the Anolon Nouvelle Copper 3-Qt. Covered Sauté Pan with Helper Handle! Now to go see what else is for sale in the other departments that caught my eye! The recipe looked great and simple too! I loved the Analon pan she used – I need one that size! I like all her cooking utensils, but I loved the saucier pan! Watching her make the sauce made it look so easy! Oh she is the cutest! I love her kitchen! I would have to get the big block chopping board! I think I’m obsessed with Serena Bass’ bangs! I would never have the confidence to pull them off, but she looks great. I absolutely love all the copper pots and pans she has in her collection — just beautiful. I love that bamboo two-tone chopping block in the video and I am totally making that sauce. It looks so yummy and definitely something my whole family would eat! I’m visual, so I love seeing things demonstrated (sure beats reading a recipe in a cookbook)! My fave item is the Anolon cookware! What a simply delicious looking sauce! I’ve never thought to add lemon zest to my pasta red sauces. Also, how does she make dicing look so quick and easy!? And I think I’d probably get the most use out of the Culinary Institute of America 15-Piece Baking Set! Um that awesomely easy (and what looks to be yummy recipe!) I’m in love with that copper-bottomed Analon saucepan! Thanks for this opportunity! I like how she makes it look so easy. I most like the Analon Saucepan. I loved how simple the recipe was! I can do that 😉 and as for her products, I like the clay baker & bamboo cutting board! I love so much of her goodies and loved the paint color on her kitchen walls. I need a new cutting board and hers looks great. I also need new flatware and she has curated a great set of Wallace Continental hammered flatware that I could get with some help of the $100 gift card! Thanks for a great giveaway and a new place for me to dream and get into trouble on MyHabit.com! Loved it- Loved how that knife just sliced that food right up – so easy! I also am liking the dessert plates she has on sale! CUTE! I have been registered for there and watch the emails for good deals! Love the cutting board. I love the Anolon Nouvelle Copper 11″ Square Griddle! Watched the video and now I am hungry! Loved the knife and cutting board. Loved the aqua color of her walls!! Oh..and her bamboo cutting board! LOVE finding new things and places! I’m learning the value of good quality knives. That chef knife looked great. nicely shot video, tasty & easy looking recipe, sharp Knife! Love anyone who can chop like that! That knife must be the key. I would love to have one! Mmmm….loved the simplicity of the dish featured. Unintimidating and inspiring. I could make this tonight! I love MyHabit.com, I have bought from them before and i love the free shipping! I liked Serena’s Black nail polish in the video :-). My favorite item is the Regas set 6 Premium casseroles, black. i loved the plain white dishes she used, and the turquoise walls in her kitchen! Um, yum! I loved the cutting board. So streamline. I also loved the kitchen–so homey. Great video – bright colors, yummy food and a fun chef! I could really use a sharp knife in the kitchen – tired of “sawing” through food. The pasta looks delicious! I would love to have a new chef’s knife! Love the knives she was using:) But the pans are pretty amazing too. Loved the Analon covered saucier. I would get tons of use from that. Loved watching the video……Ms Serena is just lovely…..I really liked the pan, though…I so need a good ione! Love the cutting board. I so need a new one. Recipe looks yummy. love the clay baker! the pasta recipe looks so easy and delicious! I would love that saucepan!! How simple she made it look. 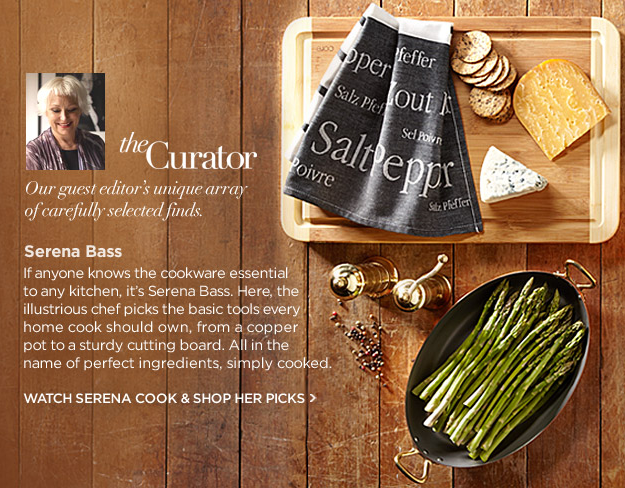 I would love the copper sauce pan. Wow that looks easy and good!! I liked the knife she uses. YUM! One of my favorite sauces. I love the Driftwood skinny jeans. I need a new cutting board (bad). I loved that it looked simple, and I thought the lemon zest made it interesting. If I had to pick just one item from the Serena Bass collection, it would be the 6″ chef knife because I know it would get a lot of use in my kitchen. OMG the copper sauce pan is so prettty… There are so many things I like in her sale but I agree with you on the copper trend coming 🙂 Her video was great. You can tell she was in her own home doing it. Thanks and I hope I win! The knife looks awesome & the video overall is shot beautifully. Made making a pasta dish look super easy, yet elegant in the end…oh and looked delicious too 🙂 Loved the cutting board! Thanks for sharing!! LOVE money saving sites! Opps- missed what I was supposed to write! I liked the photography/ videography of the items- made them look irresistible! I would love the serving dishes!